Leyland Trucks are the UK’s only remaining builder of light to heavy commercial vehicles. They sell under the DAF brand with the LF (above) being designed, engineered and built in Lancashire. A diesel-electric hybrid truck has been donated by Leyland Trucks to the British Commercial Vehicle Museum following its use by the company as part of an extensive development programme of this advanced technology. The vehicle was handed over by Ron Augustyn, Managing Director of Leyland Trucks, to John Gilchrist, Chairman of the Board of Trustees of the museum, which is located in the centre of the Lancashire town of Leyland. 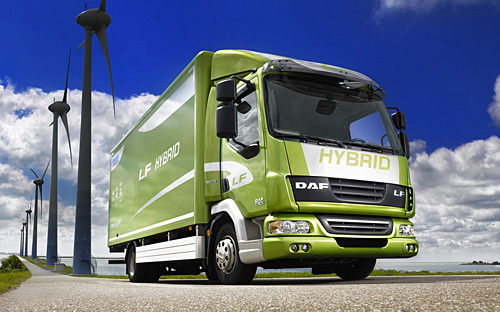 The hybrid truck is based on a standard 7.5 tonne DAF LF model and uses a 4.5 litre diesel engine in conjunction with an electric motor/generator, which operates in various modes to maximise fuel economy savings. The vehicle harvests energy usually wasted during braking events to charge the hybrid batteries. During operation the vehicle automatically switches from pure diesel drive to electric drive, which is both silent and cleaner. A six-speed automated transmission is fitted along with a 44 kW electric engine/generator and 96 Lithium Ion battery cells, each giving an output of 3.4 volts. Located on King Street in the centre of Leyland, the British Commercial Vehicle Museum offers a fascinating and enjoyable day out for people of all ages. As well as an unequalled range of permanent exhibits it stages numerous specialist events and gatherings throughout the year, welcomes educational and group visits and is available for private events. The British Commercial Vehicle Museum is easily accessed by road from Junction 28 of the M6, from where it is clearly signed, and is well served by public transport, both bus and rail. Previous Land Rover: Discovery of good news hailing from Halewood! Next Jalopy Corner: Last ever Leyland bus comes home.